Usually a homeowner who discovers nesting bees will call us within a few days to inspect and determine how to remedy the issue. 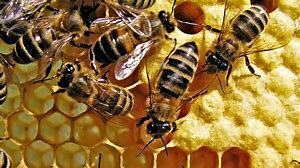 Other times, a hive has gone undetected for a long time, in a shed flood or outbuilding, for example,and are only noticed after someone has gotten stung or the bees have become protective of their hive. Quite often, however, we receive calls from homeowners who knew that bees were nesting on their property and simply thought that they would leave on their own after awhile. This almost never happens. These types of situations tend to occur this time of year in late summer. Those bee swarms that were on the move in early spring and found a place to nest, are now well established and have put down a great amount of hive containing brood and honey. These colonies can be found in unusual places. Here in Arizona, these hives tend to be quite aggressive, and are not able to be handled by the homeowner as a DIY job. Another situation which occurs is that in the extreme heat of the summer, hives which are exposed as in the eaves of a roof or a tree, may begin to break up and fall to the ground. In hidden areas, where honey may begin to run down walls and onto patios or garage floors, the homeowner is likely facing damage to their home as well as a costly hive removal. There is probably not even an issue here. Bees are our friends as they are great pollinators. If they are just buzzing around from plant to plant, and do not behave aggressively, they are just visiting, and they will move on. Wait it out. If they don’t leave, call us as soon as possible to remove and relocate bees before they are well established. If they leave, walk your property to be sure they have not moved into structure or hiding places like BBQs or water valve boxes. If you see a steady stream of bees coming and going from one particular area, you have nesting bees, and you need a bee removal professional. Have them relocated. When bees are in the swarm stage, they can be easily removed and relocated before they move into your home or that of your neighbor. This is the most successful and humane way to move bees out of urban settings to a location where they and humans can remain safe. ASAP Bee Removal is pleased to offer live swarm relocation. If you think you have bees nesting on your property, call for bee removal as soon as possible. In some instances, a live removal may be possible. If they are nesting in an inaccessible area it will be necessary to eradicate them. Honeybees will not voluntarily leave a nesting location that is suitable to them, and bees will do serious damage if left untreated. In addition, these established hives become increasingly more territorial and aggressive, containing africanized honeybees. Eventually, the hive gets too big for the space to contain, and it will produce a new queen bee and a new swarm to search for another nesting location. We commonly treat multiple bee infestations on one property when the bees have been ignored. The result is serious property damage and added expense. Don’t just ignore bee activity on your property. Take the time to assess what is going on. Call ASAP Bee Removal at 602-751-1002 for expert advice and a free phone estimate, or to schedule a property inspection. We are able to professionally handle all aspects of the bee removal process.